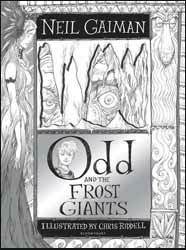 Odd and the Frost Giants (2016. 123 pages) is a heavily illustrated fantasy tale, written by Neil Gaiman and illustrated by Chris Riddell. The book is illustrated with pen and ink pictures, anything from minor side panels to double page spreads, with much of it beautifully highlighted in silver. The book is a perfect synergy of tale and graphics; I could spend as much time pondering Chris Riddell’s illustrations as I could enjoying Neil Gaiman’s prose. The story is quite short, in fact I read the whole thing while taking a bath – sorry for that image - but its lack of breath should not put you off, although Gaiman makes the whole thing look ridiculously easy, the short form of writing is actually more difficult than a novel. In the shorter form the author has far less time to engage the audience or make the reader empathise with the main characters, but Gaiman seems to do this effortlessly. The only down side of the whole thing is that it leaves you wanting more.